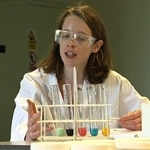 A short science career video on twenty three year old Food Scientist Rachel who is a Cambridge University trained biochemist who has been taken on by Heston Blumenthal, owner of the world famous Fat Duck restaurant at Bray. Her job is to carry out research for her PhD into the molecular make up of flavours and how they can be applied to food in a small kitchen environment to create exciting and different eating experiences. The Fat Duck has just been voted the best restaurant in the world. The ethos of the restaurant is to use scientific techniques to create a completely new approach to food and the dining experience. Together with a traditional kitchen the restaurant has a fully equipped laboratory. A typical menu might start with a pallet cleansing liquid nitrogen drink, Snail Porridge then a Sardine on toast sorbet, followed by Salmon poached with liquorice, then White chocolate and caviar with a dessert of Smoked Bacon and Egg Ice cream. To round it all off there are Oak and Tobacco chocolates The work Rachel carries out is to understand the chemical reactions that take place when food is cooked. By using her science background she can help Heston and his team create the wild dreams of fantasy Rachel is briefed by Heston and Chris his assistant to return to her lab and experiment until she has perfected the technique they want to create. She looks at the process of cooking right down at the molecular level in order answer the puzzles she is given Following her undergraduate degree Rachel combined her love of food with chemistry and moved to France to work with a chef conducting experiments to prove or disprove “old wives tales” in French cookery. Whilst in Paris she attended and graduated from a world-class chef school and went on to work at a three star Michelin restaurant as a food scientist. Rachel is quite unique in not only what she does but in what she has done. Heston Blumenthal and Nottingham University placed a joint advertisement in the press for a PhD research student to take up the sponsorship and work at Nottingham, they received hundreds of applications from both chefs and scientists, but only Rachel was both. Within five minutes of sending in her e-mail application they were on the phone to her calling her in for an interview and she had a yes pretty soon after that.